Draft: 2011, Cleveland Indians, 1st rd. 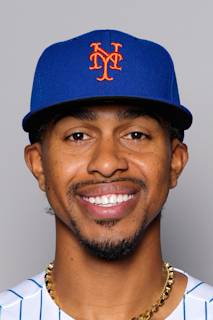 Full name FRANCISCO MIGUEL LINDOR...Single...Hit .528 (28/53) during his senior season at Montverde (FL) Academy High School with 6HR, 13 RBI and 20 steals and was named to the USA Today All-USA high school baseball team...Was also a Rawlings First Team All-American in 2011 and won the home run hitting contest at the Aflac All-American Game in August of 2010 in San Diego's PETCO Park... Moved to the Orlando area when he was 12 years old...In 2009 he helped Under-16 Team USA to a gold medal in Taiwan by hitting .500 with three triples and six steals...First prep player selected by Cleveland since 2001...Was ranked as the 7th best prospect in the entire draft by Baseball America (3rd highest position player) and Perfect Game...Participated in the 2014 Caribbean Games for the Puerto Rican National Team...On Twitter: @lindor12bc...Very active in the community, visiting numerous Boys and Girls Clubs and MLB Academies in Cleveland and around the country during the season...Hosted a Play Ball youth event on Jan. 21, 2017 in his hometown of Clermont, FL...Was also the brainchild of the "Lindor Smiles" community endeavor initiative that benefits the Miracle League of Ohio, which provides an opportunity for children and adults with mental and/or physical challenges to play baseball...2016-18 Tribe Fest participant... Lindor is active with the Boys & Girls Clubs of Cleveland and MLB's Reviving Baseball in the Inner Cities Program...In 2018, Frankie is helping he Boys & Girls Club promote their Race for Kids, a fund raising event for after-school and weekend programing. Enjoyed a tremendous season, collecting career-highs in almost every offensive category, earning his third straight American League All-Star bid and again setting a single-season franchise record for home runs by a shortstop (38) for the second straight season...Became the first shortstop in MLB history and first in Indians history with at least 35 home runs, 40 doubles and 20 stolen bases...Is the third Indians hitter to amass at least 120 runs, 40 doubles and 35 homers (Albert Belle 1995; Hal Trosky 1936)...Tied for the Major League lead in runs (129), becoming the first Indians batter since Grady Sizemore (2006, 134) to lead MLB in runs...Also finished among MLB leaders in multi-hit games (2nd, 58), total bases (T2nd, 343), and extra-base hits (T5th, 82)...His 129 runs were the 10th-highest single-season total in franchise history... Finished among A.L. leaders in runs (T1st, 129), total bases (2nd, 343), multi-hit games (2nd, 58), extra-base hits (T3rd, 82), hits (4th, 183) and home runs (T6th, 38)...Is now the club's all-time career leader in homers by a shortstop (96)...Batted .291 (113-for-388) in the first half with 85 runs, 30 doubles, 25 home runs and 62 RBI in 94 games, the first MLB shortstop ever with at least 75 runs and 50 extra-base hits before the All-Star break...Connected for a franchise-record & MLB-high nine lead-off home runs, eclipsing Sizemore's seven in 2008....Now has 12 lead-off homers in his career (3rd-most in club history), the last of which came on Sept. 26 at CWS...Was named A.L. Player of the Month in May, batting .373 (44-for-118) with 10 HR, 23 RBI and a 1.169 OPS...First career A.L. monthly award...Enjoyed some prolific games during the season, collecting two homers and two doubles on May 12 vs. KC and May 31 at Minnesota, the only Indians player in club history with two such games in the same season and over an Indians career... First Indians lead-off batter since 1964 (Tito Francona) with four extra-base hits in the same game...Collected multiple extra-base hits in 17 games on the season, tied with José Ramírez and Javier Báez for the second-highest total in MLB in 2018 (Mookie Betts - 18) and the most ever by an Indians shortstop in a single season (Lou Boudreau, 16, 1940)...Had three games of at least three extra-base hits...Clubbed two homers in six contests, last coming on Sept. 6 at Toronto (eighth career two-homer game), tied for second in MLB with Manny Machado behind Oakland's Khris Davis (7)...Enjoyed a career-high 15-game hitting streak, April 29-May14, and collected an extra-base hit in nine straight games, May 1-9...Homered in three straight games two times over the course of the season...Connected for his second career walk-off home run on August 8 vs. Minnesota...Collected a single-game career-high seven RBI on July 2 at Kansas City, hitting his second career grand slam off Jakob Junis (Fourth Indian w/a GS and three-run HR in same game)...On the year he made 157 starts at shortstop and one start at DH...Compiled a fielding percentage of .976 (586 TC, 14 errors) and his 14 defensive runs saved (Fangraphs) ranked tied for third among MLB shortstops...Recorded a career-high 47 consecutive errorless games, July 27-Sept. 18, and recorded only one error over his final 58 games on the season...Made 153 starts out of the lead-off spot, leading the Majors in homers (37) and RBI (90) while batting first...Posted a season average of .343 against left-handed pitching, fourth-highest in the A.L. and sixth-highest in MLB (1.006 OPS was third-highest in the A.L. )...Tied for fifth in the A.L. in second-half runs (44) and T10th in hits (70)...Batted .259 (53-for-205) with runners on base, but hit just .212 (18-for-85) in the second half with men on (35-120, .292 w/men on first half)...Recorded a .281 batting average (36-128) and a .406 on-base pct. with RISP...29 of his home runs were solo homers and 29 were against RHP. Enjoyed a tremendous season, collecting career-highs in almost every offensive category in just his second full season at the Major League level, earning his second straight All-Star bid and setting a single-season franchise record for home runs by a shortstop (33)...His 33 home runs were also the most in club history by a middle infielder, surpassing 2B Joe Gordon's total of 32 in 1948...Most home runs by a Major League shortstop since Hanley Ramirez (33) in 2008...Most extra-base hits (81) by an Indians SS in club history and the most by a MLB shortstop since Jimmy Rollins (88) and Hanley Ramirez (83) in 2007...Second SS in club history to win Louisville Slugger Silver Slugger Award (Asdrúbal Cabrera 2011)...Earned fifth place finish in the 2017 A.L. MVP voting announced on Nov. 16. Broke Asdrúbal Cabrera's club record (25 in 2011) for home runs by a shortstop with 33 long balls, the most in Major League history by a switch-hitting shortstop, besting Jimmy Rollins (30, 2007) and Jose Valentin (30 in 2004)... His 81 extra-baggers are 2nd-highest total in MLB history for a switch-hitting SS behind Rollins' 88 in 2007...Lindor joined Hal Trosky (42 in 1936 and 35 in '34) and Manny Ramirez (31 in 1995) as the only Indians players 23-or-younger to have at least 30 HR in a season...Became the first shortstop 23-or-younger to enjoy a 30-homer campaign since 1999, when Alex Rodriguez launched 42 at 23...Led Major League SS in homers and led American League shortstops in OPS (.842) and was second in hits and runs scored. Season really got going in the second half, hitting .298 (90/302) with 19 doubles, 19 home runs, 46 RBI and 50 runs scored in 74 games...Finished 2nd in the A.L. in hits in the second half and was tied for 10th in HR after the break (T4th in runs/50)...From August 20 thru the end of the season he batted .308 (49/159) with 11 2B, 14 HR and 33 RBI over his final 40 games...Collected an extra-base hit in 10 straight games, Sept. 7-16, breaking the franchise record of 9 straight held by Sandy Alomar (9/28/96-4/13/97) and Hal Trosky (1934)... Equaled the longest such streak in MLB in 2017 (HOU's Alex Bregman)...Hit .360 (31/86) with 19 runs, 4 2B, 2 3B, 9 HR & 20 RBI over the A.L. record 22-game winning streak, Aug. 24-Sept. 14...His 16 extra base hits in April were the most by an Indian since 2001 (18; Juan González). Hit his first career grand slam and collected his first career 5 RBI game on April 5 at Texas, homering from both sides of the plate (second career 2-homer game)....Enjoyed three hitting streaks of at least 12 games, netting a season-high 13 game hitting streak from July 21-August 3 (only MLB player in 2017 with 3 hitting streaks of at least 12 games) ...Batted .360 (31/86) over the club's A.L. record 22-game winning streak, Aug. 24-Sept. 14 (19R, 4 2B, 2 3B, 9HR, 20 RBI). Notched his second career 4-hit game and collected a career-high 3 doubles on July 16 at Oakland...On the year he made 158 starts at shortstop, recording a fielding pct. of .984 (10E, 611TC), ending the year with a 6-game errorless streak and saved 5 runs on the season according to Fangraphs...Reached via hit or walk in 135 games...Hit .214 (24/112) in June and season average low-ebb point was .246 on July 4...Batted .301(98/326) from July 5 thru the end of the season...Owns a career average of .320 (258/805, .899 OPS) in Progressive Field...Batted .283 (64/226) with runners on base and hit .281 (75/267) with 44 runs scored and a .904 OPS in 63 starts in the lead-off spot...His .291 (53/182) average from the 7th inning-on was 12th-best in the league. Enjoyed a stellar sophomore season for Cleveland, his first full Major League season and was named to the American League All-Star team (at 22 years old was the 4th-youngest All-Star in team history)…Finished 2nd among American League shortstops in runs, hits and batting average and fourth in RBI while leading the team in hits and runs scored…Led the Majors in sacrifice flies and finished in the top ten in the American League in B-R defensive WAR and hits (see box below)… Saved 17 defensive runs for the season according to Fangraphs…Won his first Rawlings Gold Glove award and was named the league's Platinum Glove winner as well as best overall fielder... He is the second-youngest Indians player to earn a Rawlings Gold Glove Award behind Rick Manning (21 in 1976) and the youngest Major League player since Manny Machado (21 in 2013)....Second-youngest Major League shortstop to earn a Gold Glove behind Detroit's Alan Trammell in 1980 (22.227 in 1980)...Hit at least .293 in each month of the season before hitting .233 (21-90) in Sept/Oct (did walk 19 times to post a respectable .365 OB%, 15 runs)…Batted .341 (42-123) in 30 August games with 4 2B, 2 3B, 2 HR, 13 RB and 16 runs…Average went from .313 to .301 over the last month of the season as he fell from 6th to 11th in the A.L. in average over that span…Endured a career-high 0-for-29 (27 at bats, 2 SF) from Sept. 16-28 that took his average from .313 to .300...Made 153 starts (155 games) at shortstop during the season and led the team with 158 games played with Carlos Santana…Also made 1 start at the DH spot…Was tied for second in Major League Baseball with 23 games of at least three hits, the most such games by an Indians batter since Earl Averill (29) and Hal Trosky (24) in 1936…Was tied with Jose Altuve behind Jean Segura (24) for the most in baseball this season…From July 5 thru the end of the season he batted .303 (88-290) with 46 runs, 15 2B, 5 HR and 37 RBI over the last 77 games of the season...Enjoyed a career-high four hits on Sept. 3 vs. Miami…Enjoyed his first career two-homer game on June 25 at Detroit...From Sept. 10-on he batted .103 (6-58) with 8 runs, 1 HR and 9 RBI over the last 19 games of the season (did not homer from Aug. 10-Sept. 29; endured 0-for-29 from 9/16-28)…Reached base safely via hit or walk in 46 of his final 54 games of the season after August 4...Had a .401 on-base pct. at home…Batted .301 (82-272) with runners on base, .190 (11- 58) with RISP-2outs…Hit .273 (18-66) on 0-2 counts, the 7th-highest mark in the A.L… Second in the A.L. in assists at shortstop (447), 1st in total zone runs as a SS (24, B-R), 4th in putouts and 4th in range factor (4.27), fielding pct (.982, 12E, 674TC)...Finished tied for 9th in the A.L. MVP voting after the season (56 points; Miguel Cabrera)... Hit .310 (18-58) in the Postseason with 5 runs, 3 2B, 2HR & 6 RBI in all 15 games...Hit first career Postseason HR, 10/6 vs. BOS (Porcello; G1)…Had 3 straight multi-hit games (ALDS G3-ALCS G1/2); first Indians player in PS since Omar Vizquel (1998)…His 7 multihit games were most-ever for a player less than 23 years old)…Led team in hits in Postseason…His 18 hits were most by an Indians batter in PS since 1997...His 8 hits in the World Series were most ever by a player that young in club history; the youngest player to record eight-or-more hits in the World Series since Florida's Edgar Renteria (21) had nine hits in the 1997 World Series....7th player age-22-or-younger to record 3 multi-hit games in the World Series, joining Renteria (1997), Tony Kubek (1957), Mickey Mantle (1952), Dib Williams (1931), Jimmie Foxx (1929) and Jimmy Sebring (1903). Spent the last four months of the season at the Major League level and immediately vaulted himself into the American League Rookie of the Year discussion...Led A.L. rookies in batting average (.313) and WAR (4.6) and ranked in the top 10 in a host of offensive categories (see box at right), stabilizing the left side of the Cleveland infield despite being the 8th-youngest player in the A.L. at the time of his promotion...Became the first Indians rookie with at least 10 steals, 10 homers, 20 doubles, 100 hits and .300 average since 1929 (Earl Averill, age 27)...Spent the first two months of the season in Triple-A Columbus prior to his June 14 promotion, hitting .281 (64-228) with 11 doubles, 5 triples, 2 home runs and 22 RBI in 58 games for the Clippers...At the time of his call-up he ranked tied for 9th in the International League in hits and tied for 4th in triples and over his last 12 games in June he batted .404 (19-47) with 2 2B, 2 3B, 1 HR and 3 RBI to raise his season average from .249-.281...Hit .325 (13-40) with RISP for the Clippers after entering the season the 4th-rated prospect in all of Major League Baseball (MLB.com)...Collected his first Major League hit in first at bat of his Major League debut, a pinch-hit single at Detroit on June 14 off Joakim Soria...Hit his first Major League home run on June 24 vs. Detroit (Buck Farmer)...Hit .223 (23-103) with 6 runs, 3 2B, 2 HR & 9 RBI over his first 26 games thru the conclusion of the first half before becoming one of the best players in the American League after the break, hitting .345 (99-287) with 44 runs, 19 2B, 4 3B, 10 HR & 42 RBI in 73 second half games....Ranked 1st in the entire A.L. in second half batting average, 3rd in hits, 11th in on-base pct (.386), T15th in runs scored .and 10th in OPS (.930) after the break... In his first career start at Chicago-NL on June 16, he collected his first run, RBI and stolen base (2-5, R, RBI, SB)...Overall he made 97 starts at shortstop (98 games), compiling a fielding pct. of .974 (10E, 389TC) with a UZR of 10.5 and 10 defensive runs saved, both of which led American League shortstops in 2015...Hit safely in 73 games with Cleveland and led the A.L. in sac. hits (13) and was 5th with 20 bunts in play...Collected a career-high 4 RBI on July 30 vs. Kansas City, again on Sept. 16 vs. KC and finished a double shy of the cycle on Sept. 9 at Chicago-AL (3-5, 3B, HR, RBI, 2R)...Hit .370 (40-108) in 28 August games with 18 runs, 8 doubles, 2 home runs and 12 RBI (.913OPS), collecting the most hits in a single month by an Indians rookie since August 1964 (Chico Salmon)...From August 4 thru the end of the season he batted .361 (MLB-high 78 hits in 216AB) with 35 RS, 17 2B, 4 3B, 7 HR and 32 RBI in 56 games. to raise his average from .253 to .313...Hit in a season/career-high 10 straight games from August 4-15...Enjoyed 39 multi-hit games for Cleveland and hit .342 (105-307) from July 8 thru the end of the season...Batted .325 (53-163) with runners on base, the 11th-best mark in the American League...His .321 (45-140) average vs. LHP was the 11th-highest mark among all A.L. batters...Batted in the two-spot in the order in 85 games for Terry Francona...Just the third Indians rookie in club history with at least 10 HR and 100 hits before their 22nd birthday (others Hal Trosky 1934, Ken Keltner 1938)...His 99 hits since the All-Star break were the most in one year by a Cleveland rookie since 1947, when Dale Mitchell tallied 129 hits (Elias)...Finished runner-up to Carlos Correa in The Sporting News A.L. rookie of the year player voting after the season. Split the 2014 campaign between AA Akron and AAA Columbus, where he hit .276 (140-567) w/16 2B, 4 3B, 11HR, 62 RBI and 75 runs scored in 126 games...Also collected 28 stolen bases, 3rd-most in the organization...Started the year at Akron, missed a week from June 26-July 1 w/a broken nose (bad hop ground ball) and was promoted to Columbus on July 21...Named an organizational all-star by MILB.com ...Selected to his third straight Future's Game and was an Eastern League All-Star selection...After the season played for Peoria in the Arizona Fall League, hitting .265 (26-98) with 5 2B, 1 3B, 3 HR, 9 RBI and 15 RS in 24 games...He enters the season as the #1 rated prospect in the Indians organization according to Baseball America, MLB.com and Baseball Prospectus...Ranked as MLB's 4th-best prospect in the annual MLB.com Top 100 entering 2015. Hit a combined .303 (122-403) with 22 doubles, 7 triples, 2 home runs and 34RBI in 104 games between A Carolina and AA Akron (.380OB/.787OPS, 25SB)...Led the Indians Player Development system in batting average...Spent the first three and half months with Carolina and was promoted to AA Akron on July 16 after playing in his second straight XM Future's Game...Was also a Carolina League midseason all-star...Entered 2013 as the top prospect in the system according to MLB.com and Baseball Prospectus and was second according to Baseball America...Overall among MLB's top 100 overall prospects he was 28th/14th, respectively, according to Baseball America and MLB.com...Also named as the system's best defensive infielder and as having the best strike-zone discipline by BA...Season got off to a fine start in Carolina, hitting .340 (31-91) in 24 April games with 12 RS, 6 2B, 1HR & 10RBI...Hit above .283 in all four months he played in Carolina...At the time of his 7/16 promotion he was T1st in the Carolina League in triples, 4th in batting average, 4th in hits, 7th in steals and 9th in on-base pct...After promotion to Akron he did not play after August 14 due to a stress reaction in his lower back...Combined between the two levels he hit .324 (99-306) off right-handed pitching and .237 (23-97) off LHP...Enters 2014 ranked as the top Indians prospect according to MLB.com, Baseball America and Baseball Prospectus...Overall among MLB's top 100 overall 2014 prospects he was ranked 10th/6th by MLB.com/Baseball Prospectus...Also named as the system's best defensive infielder and as having the best strike-zone discipline by BA entering the upcoming season. Entered the 2012 season ranked as the top prospect in the organization according to Baseball America and Baseball Prospectus and appeared in the Future's Game for the World Team in KC, MO...Entering 2012 season among MLB's top 100 prospects ranked 37th/32nd overall, respectively, according to Baseball America & MLB.com...Named to the Midwest League midseason and postseason all-star teams and was rated by Baseball America as the 3rd-best MWL prospect after the season...Led Midwest League with 8 intentional walks, finished T5th in runs scored (83, led organization)...His 27 steals ranked 4th in the Indians system. April 15, 2019 Cleveland Indians sent SS Francisco Lindor on a rehab assignment to Columbus Clippers. March 28, 2019 Cleveland Indians placed SS Francisco Lindor on the 10-day injured list retroactive to March 25, 2019. Left ankle sprain and right calf strain. June 14, 2015 Cleveland Indians selected the contract of SS Francisco Lindor from Columbus Clippers. January 27, 2015 Cleveland Indians invited non-roster SS Francisco Lindor to spring training. November 13, 2014 Peoria Javelinas reassigned SS Francisco Lindor to the minor leagues. September 18, 2014 SS Francisco Lindor assigned to Peoria Javelinas. July 22, 2014 Francisco Lindor assigned to Columbus Clippers from Akron RubberDucks. July 22, 2014 SS Francisco Lindor assigned to Columbus Clippers from Akron RubberDucks. January 22, 2014 Cleveland Indians invited non-roster SS Francisco Lindor to spring training. September 9, 2013 Francisco Lindor roster status changed by Akron Aeros. August 15, 2013 Akron Aeros placed SS Francisco Lindor on the 7-day disabled list. July 16, 2013 SS Francisco Lindor assigned to Akron Aeros from Carolina Mudcats. April 1, 2013 Francisco Lindor assigned to Carolina Mudcats. February 24, 2013 SS Francisco Lindor assigned to Cleveland Indians. November 7, 2012 SS Francisco Lindor assigned to Indios de Mayaguez. April 2, 2012 SS Francisco Lindor assigned to Lake County Captains from Mahoning Valley Scrappers. August 26, 2011 Francisco Lindor assigned to Mahoning Valley Scrappers from Cleveland Indians. August 15, 2011 Cleveland Indians signed SS Francisco Lindor.